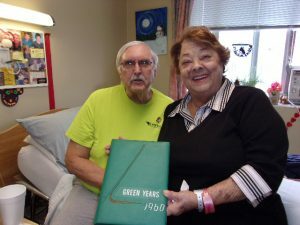 Walter Dunbar and Lois Faustino, graduates in the Class of 1960 at Abington High School, recently reconnected at the Webster Park Rehabilitation and Healthcare Center in Rockland. Dunbar, a long-term care resident, and Faustino, a short-term rehab patient, met again for the first time in 54 years during a bingo game, when they started talking and realized their common history. The classmates since have exchanged photos, memories and stories from their time growing up in Abington.